The discovery of DNA is generally credited to Watson and Crick, but many other scientists contributed to the discovery. DNA is one of the most basic molecules of life; it carries genetic instructions for the development, functioning and reproduction of all known living organisms. The discovery of DNA’s double-helix structure is largely credited to the scientists Watson and Crick, for which they won a Nobel Prize. However, the X-ray crystallography work of Rosalind Franklin and Erwin Chargaff’s work in discovering the composition of DNA were instrumental to the discovery of DNA’s structure. double helix: The structure formed by double-stranded molecules of nucleic acids such as DNA. Deoxyribonucleic acid (DNA) is a molecule that carries most of the genetic instructions used in the development, functioning and reproduction of all known living organisms and many viruses. DNA is a nucleic acid; alongside proteins and carbohydrates, nucleic acids are one of the three major macromolecules essential for all known forms of life. DNA stores biological information and is involved in the expression of traits in all living organisms. In the 1950s, Francis Crick and James Watson worked together to determine the structure of DNA at the University of Cambridge, England. At the time, other scientists like Linus Pauling and Maurice Wilkins were also actively exploring this field. Pauling had discovered the secondary structure of proteins using X-ray crystallography. Erwin Chargaff met Francis Crick and James D. Watson at Cambridge in 1952, and, despite not getting along with them personally, he explained his findings to them. Chargaff’s Rule showed that in natural DNA, the number of guanine units equals the number of cytosine units and the number of adenine units equals the number of thymine units. This strongly hinted towards the base pair makeup of the DNA. Chargaff’s research would help the Watson and Crick laboratory team to deduce the double helical structure of DNA. In Wilkins’ lab, researcher Rosalind Franklin used X-ray diffraction methods to understand the structure of DNA. Watson and Crick were able to piece together the puzzle of the DNA molecule on the basis of Franklin’s data, because Crick had also studied X-ray diffraction. In 1962, James Watson, Francis Crick, and Maurice Wilkins were awarded the Nobel Prize in Medicine. Unfortunately by then, Franklin had died. Nobel prizes are not awarded posthumously, and though her work was crucial to the discovery of DNA, Franklin was never nominated for a Nobel Prize. Francis Crick, James Watson, and Maurice Wilkins were awarded a Nobel Prize for the discovery of the structure of DNA in 1962. There is still much controversy on how her image was given to Watson and Crick and why she was not given due credit. DNA has many applications in a variety of fields including forensics and medicine. DNA is unique to each individual, and therefore can be used for identification purposes. The human genome consists of about 3 billion base pairs, corresponding to about 20,000 to 25,000 functional genes. Each person’s DNA is inherited from their parents: 23 chromosomes from the mother, and 23 chromosomes from the father. genotype: The combination of alleles, situated on corresponding chromosomes, that determines a specific trait of an individual. zygote: The single cell that arises from the union of two gametes; in animals, the cell that arises from the union of sperm and ovum. gene: A unit of heredity; the functional units of chromosomes that determine specific characteristics by coding for specific RNAs or proteins. phenotype: The appearance of an organism based on a multifactorial combination of genetic traits and environmental factors. The acronym “DNA” has become synonymous with solving crimes, testing for paternity, identifying human remains, and genetic testing. DNA can be retrieved from hair, blood, or saliva. Each person’s DNA sequences are unique, and it is possible to detect differences between individuals within a species on the basis of these unique features. DNA testing can also be used to identify pathogens, identify biological remains in archaeological digs, trace disease outbreaks, and study human migration patterns. In the medical field, DNA is used in diagnostics, new vaccine development, and cancer therapy. It is now also possible to determine predispositions to some diseases by looking at genes. Reproductive cloning is a method used to make a clone or an identical copy of an entire multicellular organism. In cloning both the original organism and the clone have identical DNA. Identical twins are, in one sense, clones of each other; they have identical DNA, having developed from the same fertilized egg. Cloning became an issue in scientific ethics when a sheep became the first mammal cloned from an adult cell in 1996. Since then several animals such as horses, bulls, and goats have been successfully cloned, although these individuals often exhibit facial, limb, and cardiac abnormalities. 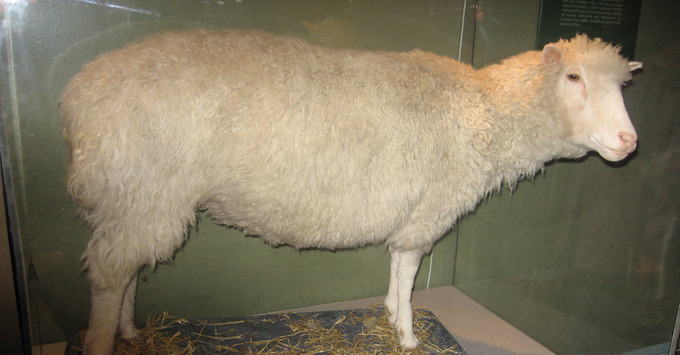 Modern understanding of DNA structure and function has led to cloning: Dolly the sheep was the first large mammal to be cloned. There have been attempts at producing cloned human embryos as sources of embryonic stem cells, sometimes referred to as ‘cloning for therapeutic purposes’. Therapeutic cloning produces stem cells to attempt to remedy detrimental diseases or defects (unlike reproductive cloning, which aims to reproduce an organism). Still, therapeutic cloning efforts have met with resistance because of bioethical considerations. CRISPR (Clustered, Regularly-Interspaced Short Palindromic Repeats) allows scientists to edit genomes, far better than older techniques for gene splicing and editing. The CRISPR technique has enormous potential application, including altering the germline of humans, animals and other organisms, and modifying the genes of food crops. Ethical concerns have surfaced about this biotechnology and the prospect of editing the human germline and making so-called ‘designer babies’. CRISPR Technique: This movie goes through the process of CRISPR. A genetically modified organism (GMO) is any organism whose genetic material has been altered using genetic engineering techniques. GMOs are a source of medicines and genetically modified foods and are also widely used in scientific research, along with the production of other goods. Genetic modification involves the mutation, insertion, or deletion of genes. Inserted genes usually come from a different species in a form of horizontal gene-transfer. Glo Fish: The GloFish is a patented and trademarked brand of genetically modified (GM) fluorescent fish. A gene that encodes the green fluorescent protein, originally extracted from a jellyfish, that naturally produced bright green fluorescence was inserted into a zebrafish embryo. Bacteria, plants, and animals have been genetically modified since the early 1970s for academic, medical, agricultural, and industrial purposes. In the US, GMOs such as Roundup-Ready soybeans and borer-resistant corn are part of many common processed foods. As in many of these biotechnology areas there is considerable controversy in the use of GMOs.